This example shows the dose distribution in water along the incident photon beam. The beam hits the water cube surface and deposits a dose under the surface of the water. The volume of the water cube is divided into slices perpendicular to the incident beam. At each slice the deposited dose and energy is computed. The slices are created using class G4PVReplica. 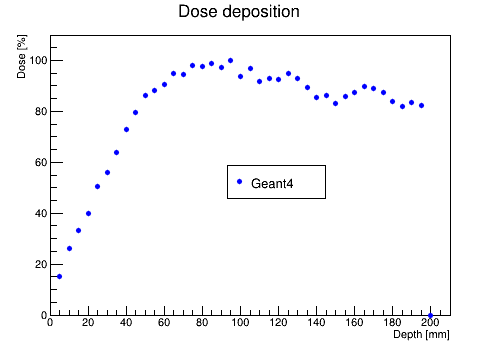 The energy and dose are scored using classes G4UserSteppingAction and G4UserRunAction. 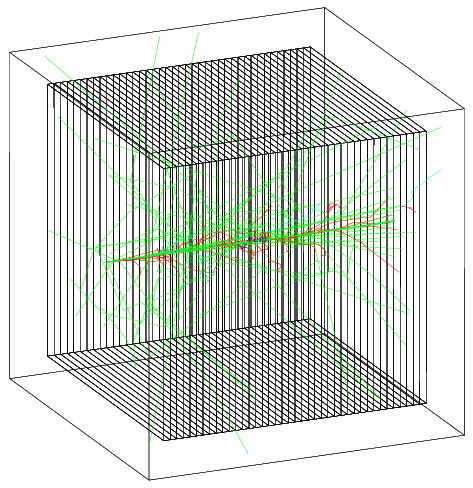 Photons are generated using G4ParticleGun class. There is an option to chose among several EM physics lists. The image shows the water box divided into slices using class G4PVReplica. Photons are in green, electrons are in red. [username@plus1 PhotonPBFolder]$ cp -r /unix/pbt/tutorials/basic/PhotonPB . 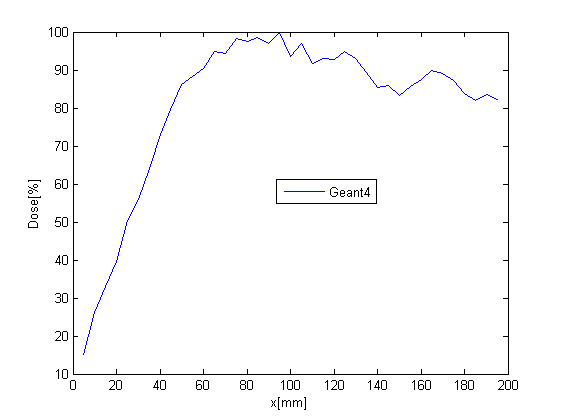 The macro produces root file Gamma.root with a histogram showing the energy deposition in water box along the beam line. It also produces text files: DoseFile.txt with energy and dose deposited in each slice and PlotDose.txt with dose deposited in each slice. This is PlotDose.txt. These values can be analyzed with MATLAB and ROOT . [username@plus1 PhotonPB_build]$ cp /home/username/PhotonPBFolder/PhotonPB_source/PlotSimulation.C . 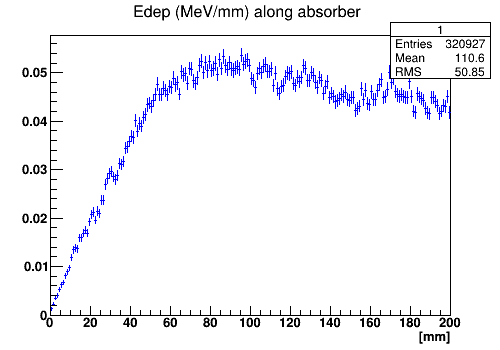 The process emlivermore is used in low energy physics experiments. This is the energy of the photon beams from cobalt-60 therapy machines. means that only one particle is generated, incident from (x0,y0,z0). The default number of events is set to 6000. Therefore, 6000 particles are incident to the water box. In this example we compute the energy deposition of photons in water box. However, there is an option to change the box material from water to lead. You can change the number of slices. The default number is 40. Keep in mind that if you want to have bigger number of slices you need to modify the file DetectorConstruction.hh in /PhotonPB_source/include/. If you want to use visualisation, in macro gamma.mac uncomment the line /control/execute visualisation.mac. This will run macro visualisation.mac with a specific visualisation setup. In this example, we use DAWN event display. Before running the visualisation look at the DAWN tutorial. The color in the images indicates the type of the particle. Photons are in green, electrons are in red and positrons are in cyan. This page has been accessed 67,609 times.